Tough questions are on the minds of Christians and non-Christians. Does God really send people to hell? Cliffe Knechtle handles these and other tough questions everywhere he goes. He has a calling -- as an open-air evangelist for InterVarsity Christian Fellowship. In this book Knechtle answers forty of the questions he most often faces. He deals directly with the hurts, doubts, struggles and conflicts of those who are searching. A graduate of Gordon-Conwell Theological Seminary, Cliffe Knechtle gives clear, reasoned answers that satisfy both your heart and your mind. 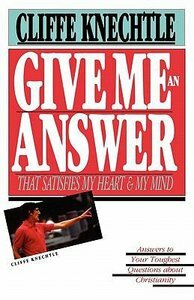 About "Give Me An Answer That Satisfies My Heart and My Mind"
1. Aren't There Many Ways To God? 2. Does God Really Send People To Hell? 3. Why Is There So Much Evil In The World? 4. How Can You Say Christianity Is Rational? 5. Why Are There So Many Hypocrites In The Church? 6. Isn't The Bible Full Of Myths? 7. What's Wrong With Having A Good Time? 8. Why Should I Believe In Christ? 9. How Can I Tell Others About Jesus?